The Asian Canadian Writers' Workshop is proud to host Ann Shin's book launch of The Family China as part of literASIAN 2013, Nov 21-24. 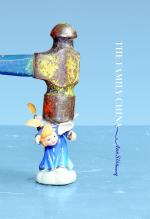 The Family China is a book of poems about the sense of belonging, about the tenuous ties we make across borders both international and internal. The Family China, her Ann's second book of poems, examines the decentering experiences of migration, loss and death, and the impulse to build anew. In five suites threaded through with footnote-like fragments that haunt and ambush the text like memories, the book accrues associations, building and transforming images from poem to poem, creating a layered and cohesive collection that asks daring questions about how we define ourselves. Smashed: poetry and the family china - interview on The Sunday Edition of Ann Shin by Michael Enright, June 16, 2013 - scroll down to "Treehouses, Donna Neufeld becomes a doctor at 48 and Canada: Whose history is it?"